This is the last week to get your entries into Bowls BC for The Champion of Champions Pairs Tournament as it is right around the corner. This is a great opportunity to get out and play the Pairs Champions for each Club around the Province. The Bowls BC Champion of Champions Pairs is a competitive opportunity for members at all Bowls BC affiliated lawn bowling clubs. 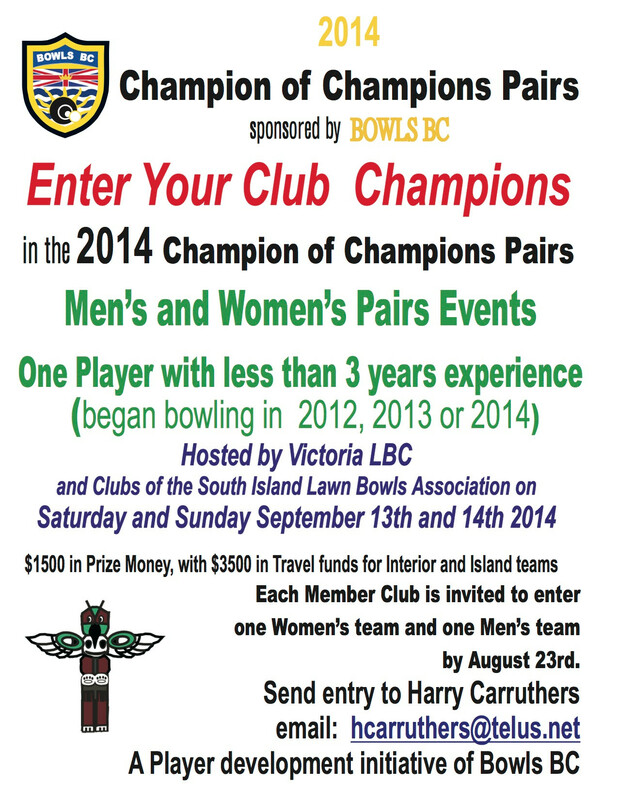 Each Club will be eligible to submit a Men’s entry and a Woman’s entry to the Bowls BC Champion of Champions Pairs tournaments to be held at Victoria LBC on September 13th and 14th. For further information, contact Harry Carruthers, by email at hcarruthers@telus.net or call Harry at 604-916-1101 (cell) or 604-985-2241 (work).